In recent years, K-POP or Korean Pop, has been widely demanded and enjoyed by global fans. Many K-POP groups, such as BTS, Twice, Seventeen, their names have been prevalent at ISB as student fans follow their favorite idol. In middle school, we even have our own K-POP dance group: FUTURE, which my client (Jade) is a part of. Thus, obviously, she is an avid K-POP fan. Not only so, she is also devoted to C-POP, or Chinese Pop. She chose two of her idols and asked for that to be the design of her catchall: VIN and WOOZI. If I had to do this again, I would have planned out the function of each part of the catchall a bit more to avoid some convenience issues for her earphones. A suggestion to future students making the catchall would be to definitely plan and try out even the smallest details of your plan. It’s okay to change it, but before changing, remember to at least try out the things you want to do with your catchall to see if it works. This product addresses my client’s needs for a place to charge her phone (and listen to music – K-POP) as well as her preferences to see her idols’ faces when writing homework or doing something at her desk. Is Top Chef Really the Top? Through a day of hardworking and semi-competition, the annual One-Day concluded with the gaining of a new experience. Never have I ever tried to cook not for the benefit of me, but to please others with sight and taste, but never can I ever say I will not try again. Hopefully in the future with the help of a bizarre miracle, I might once again attempt the amazing work of a chef. If only we hadn’t needed to clean afterwards, the day would have been perfect. There was hard competition with amazing presentations and flavors of food from around the globe made by international students; ironic, I know. Working in small teams under pressure by both time and the fact you observe others as they cook to try and beat you is some trial I’ve never experienced before. 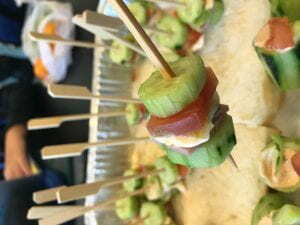 The appetizer was easy to make, and we were done well before the time limit. We knew our presentation would be fabulous, with beautiful orange and white striped smoked salmon wrapped in rose shapes, placed delicately onto a bed of green salary as if in a secret garden. There was extra material too, baguette, strawberries, and lemon, just to add some creativity and presentation. 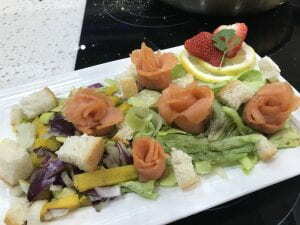 My teammate selected the dish at the very beginning, prime on it’s extravagance with the simple recipe.However, by the time of the presentation, the smoked salmon was a bit draining of the bright orange color, and the overall presentation lacked the shininess that we were aiming for. 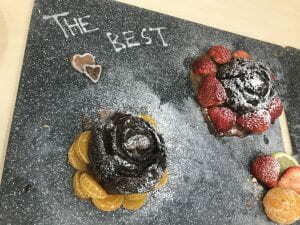 Nontheless, the taste of our dish was not horrible, and we came for runner up for our presentation. Though we were quite disappointed with the salmons’ performance. 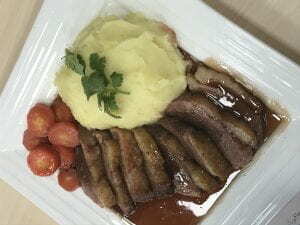 Our main dish was also quite simple, but the making was not easy. Our sauce had to be made fresh, boiled for an hour or so and then cooled. That along with an imprudent cut in our cooking time placed our group in a little stress for our sauce, but it was not a desperate situation as we utilized time for the first round to prepare our sauce and thawing the duck. We started the duck about 20 minutes into our time, and thought it was enough, as it only takes 20 minutes to finish the duck portion. What we underestimated was the time for the inside to cook to a medium rare. Under time pressure we had no choice but to fry the duck again, as we did in the beginning to get the amazing color. Nevertheless our sauce ended up to be way too sweet as we added more sugar to speed up the time needed and we only ended up being the runner up for taste. create the cake while I made my special frosting/icing. We chose our dish to be the black cutting board and used powered sugar to decorate. However, with only 7 minutes left, the dish fell to the ground, smashing to pieces and chocolate sauce spilled on the ground like blood in a crime scene. We managed to salvage it and ended up runner up for creativity. Most people don’t believe in Magic. They say it doesn’t exist. But MAGIC is all around us. 5000 Years ago, a civilization called Egypt rose in to the world. They believed in magic. They believed that gods changed the seasons and bestowed luck upon people. But they also believe that they caused harm to humans as well. They called that; magic. But they were also in capability of healing the weakened and injured. 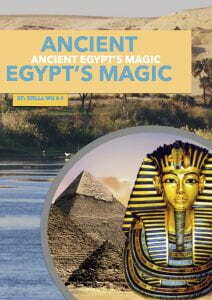 Egyptians thought is was magic. Welcome to Ancient Egypt, the birth place of many medicine, treatments, surgeries and an awesome civilization. 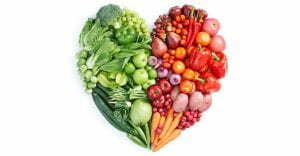 This shows the balance of nutrition to help prevent diseases. Foods that seem delicious can hold awful stories. Foods that look unattractive may be key to extending human life. In this unit, we explored the numorous ways that food and exercise keep you far from the main causes of death. AVOID IT, OR TAKE IT? This table tells me not to eat man-made foods and/or activities. I analyze that this will prevent the diseases by reinforcing our immune system and most wholefoods contain parts that of which will make the diseases evade you. I know the food under the first column is very related to our origins when we were prey and maybe back to when fire was not discovered, we had to pick fruit and vegetables which is rich in most factors (listed above) and that has been essential ever since – because we had nothing else to eat and also adds to the health of your organs because of the nutrients in the food itself. This is what I brought for our class’s healthy food party. It consists of 4 different food groups. Fruit, vegetables, meat, and diary. They were layered together with slices of each food group. 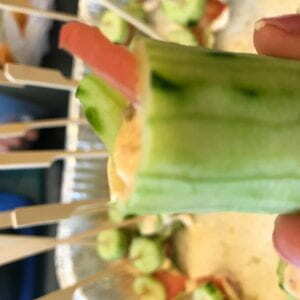 I also I scooped some cucumber seeds and filled it with salas sauce and a cucumber stick and tomato. I believe that my choice of treats shows a balance in diet, while also maintaining a favorable taste. A balanced meal was one of our main subjectives, and I believe this was one of the ways I could represent that and this will balance out to include many nutrients such as carbohydrates, vitamins, some fibres and a little of goody fat. This was also my prior choice of food because it was mainly made of whole foods and this dish was beneficial to combatting some diseases because it contains factors that can strengthen your body’s immunity. This is why I chose to bring this dish. I brought this dish also as a symbolism of the foods I normally eat; I eat cucumbers in the morning, sometimes also with tomatoes, I eat ham once in a while for breakfast, and I eat cheese as part of my lunch occasionally to maintain a balance. This Nutrition unit has help me learn about the relationship between a diet and living healthy. Many thanks to Mrs. Hamada who teaches me all these interesting and essential facts about living a better life. A story of my life, in the lines of a poem. Where I am from… Humanities Project! Check it OUT!